Try this meatless recipe as an alternative to hamburgers. In fact, this recipe is one of our children's favorites! They like to eat them with ketchup, a lettuce salad, sliced avocado, and homemade lacto-fermented dill pickles. 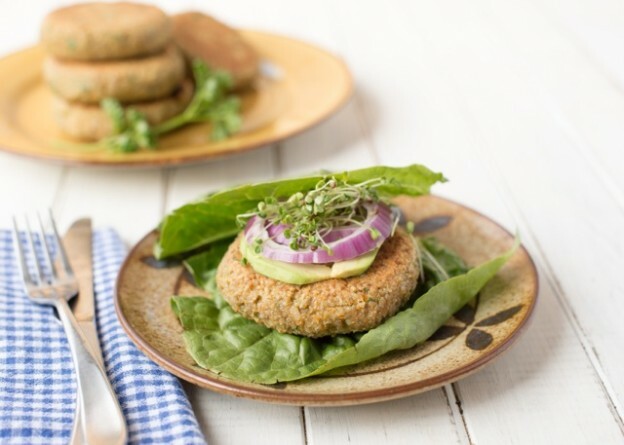 These tasty nut-free, vegan burgers can also be wrapped in lettuce leaves (instead of using a bun) and used during phase 2 of our Elimination Diet. In the photo here they are topped with thinly sliced red onion, mashed avocado, and broccoli sprouts. Remember, no ketchup on the elimination diet so try mustard instead if you need a condiment. Eden Mustard is an elimination diet-friendly brand! This recipe comes from The Whole Life Nutrition Cookbook. Serve burgers with your favorite organic condiments, sliced avocado, lettuce, tomatoes, and Gluten-Free Hamburger Buns. Bake up a batch of homemade squash or yam fries, and serve with a fresh green salad for a balanced meal. Place the rice into a 1-quart pot with a tight-fitting lid, add the water and sea salt, cover, and bring to a boil. Reduce the heat to a low, simmer and cook for 45 minutes. Remove from the heat and let stand for at least 20 minutes to cool. In a food processor, process the sunflower seeds, garlic powder, thyme, oregano, cumin, and Herbamare until finely ground. Add the carrot and parsley and pulse a few times. Add the rice and pulse a few more times to combine all of the ingredients. Be sure not to over process the mixture or it will get very gooey. Form the mixture into patties. The uncooked patties can be stored in a glass container in between pieces of waxed paper in the refrigerator for up to a week.When ready to cook, heat a skillet over medium heat and add about 1 tablespoon extra-virgin olive oil. Add the burgers and cook on both sides for 3 to 5 minutes. Hi. Is there an issue with eating sunflower seeds that are from a facility that also processes tree nuts in Phase 2 of the Diet? I have been looking for sunflower seeds and can't find any that haven't been potentially cross contaminated with tree nuts. Thanks!